In addition to the historic churches, temples and mosques that dot the Boston skyline, sacred spaces are hidden around the edges of the city, just out of view. These chapels, meditation spaces and prayer rooms serve a spiritual mission within otherwise secular institutions. Some were designed by well-known architects while others were created informally by people desiring a small retreat. They may be familiar and accessible or truly hidden from public view, but they all invite passers-by to pause, sit for a moment, and reflect. Sociologist Wendy Cadge, architectural historian Alice Friedman, and photographer Randall Armor have documented more than 60 sacred spaces in and around greater Boston. Sites include municipal buildings, shopping malls, military installations, schools and universities, health care organizations, prisons, mental health centers, cemeteries, senior living communities and rehabilitation centers. We are currently touring multiple exhibitions of these photographs and anticipate a book in the coming years. This remarkable project provides a glimpse into the life and history of the city from a sacred edge and an appreciation for what these spaces offer, both literally and symbolically, to residents and visitors alike. This project emerged, in part, from Professor Cadge’s collaborations with Professor Friedman and the late Karla Johnson, AIA, Principal, Johnson Roberts Associates. 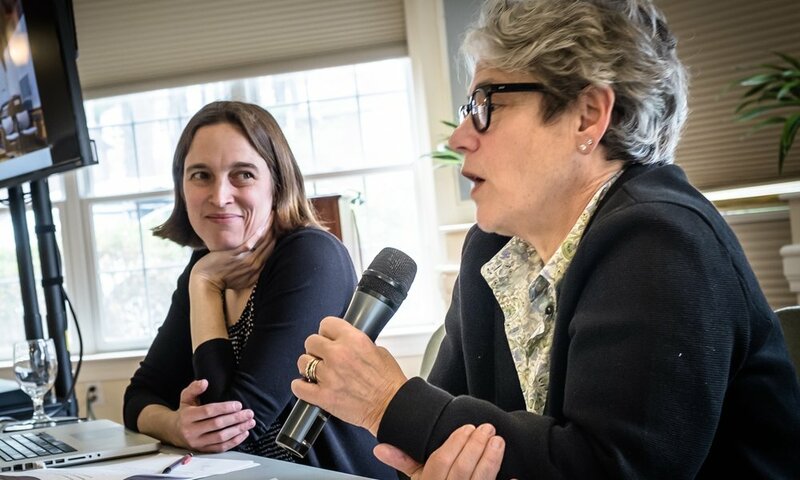 Their shared projects include Sacred Space in a Secular Nation of Believers, an exploratory seminar at the Radcliffe Institute; Multi-Faith Spaces, an online collection of case studies, design resources, and readings; and Spiritual Spaces, a database of religious buildings on college campuses. Karla designed the Interfaith Center at Tufts University and taught, through her buildings and her life, the importance of pause. We pursue this project in her memory. Boston's Hidden sacred Spaces is made possible through grants provided by Brandeis University and Wellesley College, and through the generous support of The Theodore and Jane Norman Fund For Faculty Research and Creative Projects. Our traveling exhibition has been funded in part by Mass Humanities, which receives support from the Massachusetts Cultural Council and is an affiliate of the National Endowment for the Humanities. WENDY CADGE is a Professor in the Sociology Department at Brandeis University. She is the author of Paging God: Religion in the Halls of Medicine, Heartwood: The First Generation of Theravada Buddhism in America and is a co-editor of Religion on the Edge: De-Centering and Re-Centering the Sociology of Religion. Her exploration of Boston’s hidden sacred spaces is part of a broader project focused on chaplains in the greater Boston area historically and in the present. Contact Wendy directly at wcadge@brandeis.edu. and visit her website at http://wendycadge.com. As Grace Slack McNeil Professor of the History of American Art at Wellesley College, ALICE FRIEDMAN is interested in building an interdisciplinary, feminist approach to architecture through research, teaching, and public education. She is the author most recently of American Glamour and the Evolution of American Architecture and Women and the Making of the Modern House. Her research and teaching focus on modern architecture and the history of design in the United States. She is particularly concerned with the social and cultural history of architecture, with an emphasis on issues of gender, patronage, and the history of taste, both in the United States and in Europe, 1750 to the present. This work may be licensed under a Creative Commons Attribution-NonCommercial-NoDerivatives 4.0 International License.